Some great feedback from our satisfied clients in Tetbury and across the country. Providing a full range of building surveying services to owners and occupiers of residential, commercial and industrial premises in and around Tetbury, the Right Surveyors fundamentally understand that each client has different budgetary and unique property requirements. 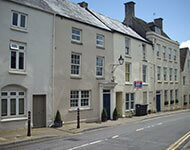 Chartered surveyors covering Tetbury, Nailsworth and the surrounding areas. Read our latest monthly property newsletter for news, information and building surveying advice from our network of property surveyors including our Tetbury Chartered Surveyors and property valuation consultants.